Welcome to GA's GuestBook design and development site! GA's GuestBook is an ASP guestbook application. Ideal solution if you wish to quickly add a GuestBook script to your site and match the existed site design. 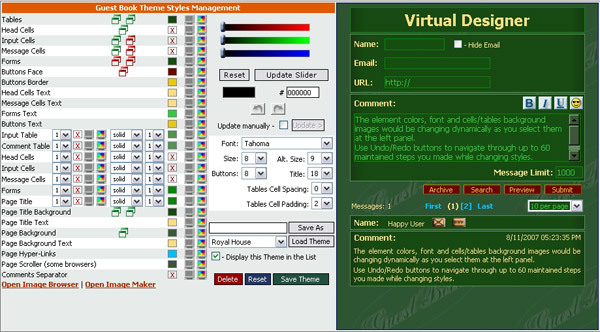 Highly interactive "Virtual Designer" and "Gradient Image Maker" online tools would help with custom design and themes development. Other features: true multilingual, image attachments, rate/counter, Email notification, archiving, search engine, reply/edit/delete messages, emotion smilies and much more. Try User or Admin Demo from links above. What is "Virtual Designer" (VD)? It is a built-in application which simulates HTML elements of main guestbook application page. The design style for each element (such as color, border, background image, font) may be changed on the fly from respective to each element style selector. That makes possible to build the entire GuestBook design from a scratch in VD by anyone with little or no experience in CSS styling, save it as a "theme" in database and then apply to the GuestBook software public page in "Preferences" administrative page. All major layers of the GuestBook script can be set to have background images for vivid 3D and other visual effects. What is "Gradient Image Maker" (GIM)? It is a built-in application for creating a color transition gradient images which could be used as background images for HTML layers assigned in VD. Using Color Gradient images to render a background of HTML layers is a popular method for creating 3D content appearance and visual effects. 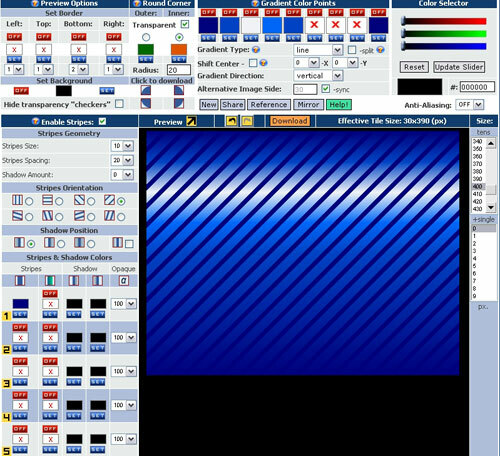 GIM allows creating horizontal and vertical gradient images with up to 7 transition color points in variable sizes. To create gradient simply apply respective color to 2 or more transition points. Created gradient references could be saved in database and retrieved at any time for amendments and for saving as image files in common background images folder. "Image Browser" is another extension for viewing all background images as thumbnails with option to span each image in any direction for a "true" background preview. Optionally image could be deleted and externally created images could be uploaded from "Image Browser" extension page. From GIM to OGIM GIM is fairly simple gradient image maker. More advanced version was introduced as an online service. 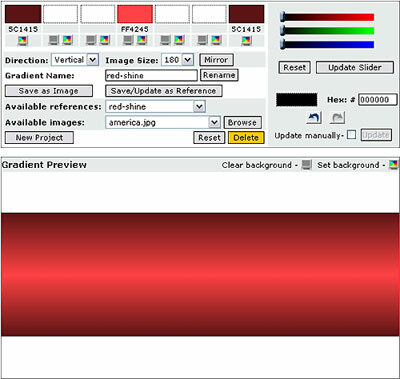 OGIM (Online Gradient Image Maker) has extremely powerful features including various type of gradients and stripes maker. Two more optional input fields "One page" guestbook structure for easy integration. Note: Older v2.1 and v2.4a of guestbook software are no longer available for distribution. Due to the database restructure new version v2.5 cannot upgrade previous releases of guestbook script.